The Great Barrier Reef first started to grow 18 million years ago. Scientists have now warned that parts of the reef are dead or dying, and it could be beyond saving within just five years. Situated on the east coast of Australia, visible from the moon, and 2,300 km long (1,400 miles), the reefs we see today that form part of the mega reef have grown on top of older reef platforms over the last 8,000 years — since the last Ice Age. The Australian government has spent at least AU$400,000 trying to keep the not-so-slow death of this incredible natural wonder away from the eyes of the public. The Sydney Morning Herald revealed that the government had paid the environment minister and others to go on lobbying trips to a range of countries in order to avoid an “in danger” listing for the Great Barrier Reef. Pressure from the government saw a chapter on Australia’s world heritage sites, among them the reef, scrapped after the Environment Department objected, Australian public media reported. Every reference to Australia is gone from the final version of the 87-page report, making it the only inhabited continent not mentioned. The report details risks at 30 world heritage sites, many of which are already being significantly affected by global warming. The Australian government seems more keen to spend money on PR exercises than on dealing with the problem, as it slashes funding for environmental programs and has reduced environment ministry jobs. It claimed to be concerned about the impact on reef tourism, though many people have since commented that UNESCO reports aren’t their go-to when deciding on a holiday. Rather, having to commit to saving the reef and certain stipulated goals could make it harder for local mining projects and associated coastal infrastructure such as ports, to get finance. Just last month, the Australian government approved a coal mining project that will involve expanding a port adjacent to the reef. It granted a license to mining company Adani to extract coal in the Galilee Basin in the north east of the country, and then ship it to India. Mining and burning more coal of course also contribute to global warming. Nevertheless, UNESCO has still warned Australia to do more to stop the damage of the reef, which is threatened by global warming, pollution runoff from the mainland, and ongoing construction along the coast. But the Australian government argued it was making “significant” progress addressing the problems, while UNESCO noted that commitments to reduce pollution runoff by 80 percent, to limit coastal development, and to reverse a decision to dump dredge material near the reef hadn’t been made law or been backed with adequate funds. Bleaching, as a result of global warming, has left half of the northern section of the reef dead or dying. Terry Hughes, director of the Australian Research Council (ARC) Centre of Excellence, which conducts research into reefs, said there has been a 35 percent loss of corals from bleaching in just two to three months. That bleaching is affecting up to 95 percent of the Great Barrier Reef. Hughes surveyed 520 reefs that form part of the greater reef, and found that only four showed no sign of bleaching. While recently bleached coral can recover, it also only takes it just six months to calcify then completely die and be replaced by seaweed and algal overgrowth. It can then no longer provide shelter to fish. Its ability to recover is also affected by water pollution. In fact, producer of the series, Anthony Geffen, said that scientists had asked him for footage from it to compare how much of the reef has disappeared. “I mean [the documentary] is only just coming out in Australia and already the footage is being used as archives to [document] the destruction of the reef,” he said. Leaving the reef out of the UNESCO report is like writing about current US politics but not mentioning Donald Trump. Editing him out won’t make him go away, and not talking about the loss of one of the largest world heritage sites won’t make the problem go away either. In fact, it seems to have backfired, with people more riled up than ever. Ignoring an issue only causes the organization or person to lose respect and legitimacy, and that’s just what may have happened to UNESCO reports with this huge censorship. Hey Buddy!, I found this information for you: "Tourism Before Truth: Australia Covering Up That The World’s Biggest Reef Is Dying". 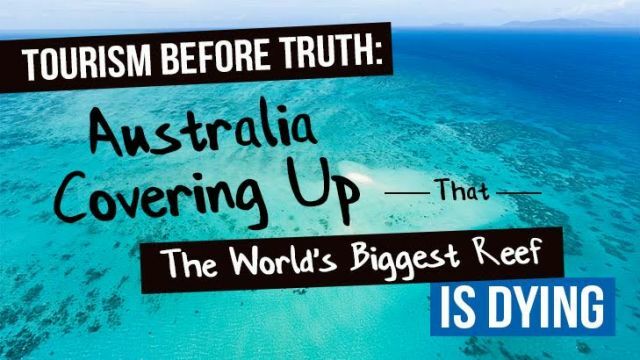 Here is the website link: https://www.thealternativedaily.com/australia-covering-up-that-the-biggest-reef-is-dying/. Thank you.